Money in the Garage: Toy product recall : Not always a bad thing. After reading the story about my Father's power saw, a loyal reader discussed how she scored on a product recall for a baby bassinet resulting in an impressive $150 profit! This brought to mind a similar product recall I had with a puppet stage that didn't quite hit that amount, but still turned into decent cash dollars for me. 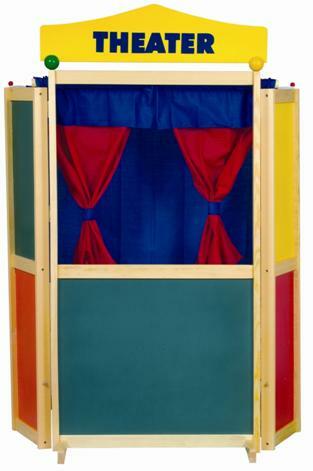 A few years back, I bought a very cool puppet stage for my kids at a garage sale. It was a quality piece made by a company that sells those heavy durable wood play toys for school classrooms. The puppet stage cost me only five dollars and my kids had tons of fun with it putting on puppet shows with their friends. As the kids got older, they outgrew hosting puppet shows and the stage sat in the corner of our basement. Around this same time, I read something in the news about a product recall for puppet stages. I checked further and sure enough, my yard sale find was under recall. The company had established a 1-800 number for consumers to call. I got right on the horn and learned the stage was assembled in China was under recall due to some lead paint. (A frequent problem with toys made in China) The nice lady who was handling my call advised me to just throw the stage in the trash and they would send me a gift certificate for $100 dollars. The certificate was good for any purchase in their toy catalog! No questions asked, throw it in the trash and I was scoring a $100 dollar gift certificate? It was like I hit the puppet stage lottery! Needless to say, I don't throw anything away unless it's food scraps from the dinner table. In fact, I dive into trash cans to retrieve other people's throw-aways! Was I going to trash a puppet stage because of a little lead paint? Please....I grew up in the Sixties. We played with lead painted toys all day and danced in the DDT fog sprayed by the mosquito man at night. I mean really....except for my hand tremors, uncontrollable facial ticks and brief moments of memory loss, I turned out just fine! The gift certificate arrived shortly thereafter and I selected some toys from the company catalog that I knew would be no problem re-selling on Ebay. Namely a wood doll house furniture set....a sure fire eBay sale! I also ordered a bunch of pretend fruit used in play kitchens. The factory fresh box of wood furniture was shipped to my house with all the furniture neatly sealed and packed in a box. I didn't even break the cellophane wrapper! I used a picture and description I ripped off the company's web site and posted the set right away. Doll house collectors were drawn to my furniture set like moths to the flame. The final auction closing price was $52 dollars. I followed this with the sale of the pretend fruit for $25. So in all I made $77 dollars...all because of a product recall! So be it a puppet stage, a circular saw or a baby bassinet, product recalls are not always a bad thing. Especially if you're an eBay seller! What proof did you you need of the product? I tried to sell a recalled Beanie Bear on Ebay - and got a stern warning. I didn't know I wasn't allowed. It's valued at $80 I bought it for $1. But can't find a venue to sell it. I would go with craiglist or try iOffer. As far as the puppet stage, they didn't ask for any documents. I am guessing once they cut me the gift certificate they put my name in their records, so they'll off the legal hook. I thought it was weird, but I was happy with it. That's great, I've bought and sold Polly Pockets too. The little figures can do well, I guess because they're easily lost, so buyers need to replace them! Let us know how you do with the recall and thanks for checking in! Finally got my mailing label and I should get a $33 voucher good for any Mattel product. Some of the sets I returned were missing some pieces so I may not get quite that much but I only paid $1 for all the polly pockets I bought and I listed the ones that were not recalled on Ebay so I should get a nice return. Beckyp-That's an awesome return, I am going to keep my eye out for all those toys at the garage sales. Like you said, most can be had for a buck or two. Apparently there are a ton of Mattel toys affected by the recall. I found this news story when I did a Google search. so I got my voucher yesterday for $36 I bought Ryker a new toy with it. That's awesome. You got me thinking...I just bought a Polly Pockets Fashion Show Set today, maybe I'll check to see if its under recall. Thanks for the update! Hot dog! Just checked and it is....G8605 - Polly Pocket!™ Quik-Clik™ Boutique (I thought it was a fashion show set of some kind, but they call it a boutique. Thanks again Becky for the info!